An Elder Scrolls Legend: Battlespire is a spin-off of the Elder Scrolls franchise and the only game in its series. 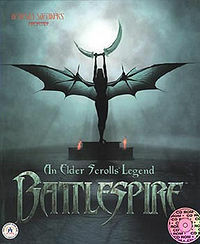 Battlespire was originally conceived as an expansion to TES II: Daggerfall, but evolved into a standalone game. The action takes place within a single multi-level dungeon, the Battlespire, where the player is sent to investigate some unusual events. It was also the first Elder Scrolls game to feature a multiplayer option. Battlespire is available for download from GOG.com. Creatures — Monsters in the game along with a picture, description, fighting tactics, etc. Hacking Guide — All kinds of information about hacking the game, file formats, offsets, etc. Features — List and some explanation of features found in the game and the required hardware to view it. Some information taken directly from Bethesda and some from rumors here and there. Official FAQ — An updated official FAQ on the Bethesda's website put up after the game was released. Contains some information on bugs, patches, improving gameplay, etc. Older Official FAQ — The official FAQ for the game before it was released. Contains preview and related information.